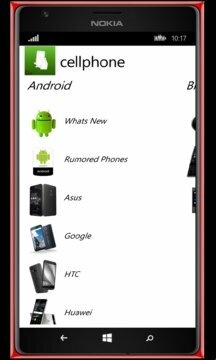 cellphone app is a smartphone companion, using this you can get your self updated will all the latest stuffs in smartphones including all Mobile OS like Android, Windows, BlackBerry, iOS, Symbian. See specs and reviews of smartphones launched by major brands. 3. 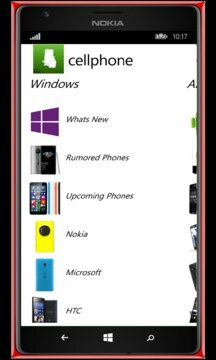 Universal app that works on both the Windows Store and Windows Phone Store. 3. Uses both the offline and online contents. 4. Once contents are retrieved it is stored in your device and no need for internet connection. 6. Listen to your smartphone news. 7. Very stable with less crashing. 3. Know latest unboxing and review videos from world's leading expert. 4. Only app that provides free technical support via email. 5. Know latest news from various best news source via full text RSS reader. 6. Exclusive details of Lumia denim and Windows 10 news. 7. See which phones are coming. 8. Which rumoured device is coming. Well space is limited, check the app and see most exciting features. To get the updates information the app need to connect to internet (3G recommended). NO APP IS EVER PERFECT UNLESS WE WILL GET THE VALUABLE FEEDBACK FROM YOU.. PLEASE RATE THIS APP AND PROVIDE THE FEEDBACK TO MAKE IT BETTER.